When I was younger, I was convinced I had to get out of my home town. I thought I would never truly grow up if I didn't move away from our somewhat small town where everyone knew everyone and there were only so many job opportunities. So, as soon as graduated from college, I moved away. 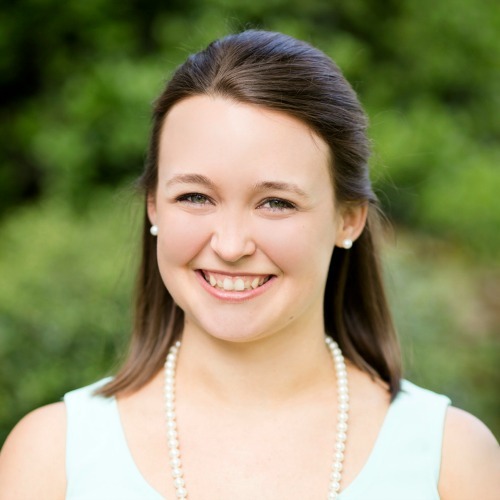 I took my first nursing job about three hours from home, just far enough to experience the independence and adventure I was looking for, but close enough to run home to mom and dad whenever I wanted. Although I now miss that laid back small town life, I am so glad that I made the decision to move when I did. I think my life would be very very different if I had started my adulthood there, and I'm a firm believer that everything happens for a reason. There's more to this story, but will get to that another day (very soon actually!). The reason I'm sharing this with you today, is because living far from home means that my husband and I have lots of house guests, especially now that we have a child. Grandparents, aunts, uncles, and close family friends want to spend time with our little guy and they need a cozy place to stay when they do! Product for this post was provided by hayneedle.com. 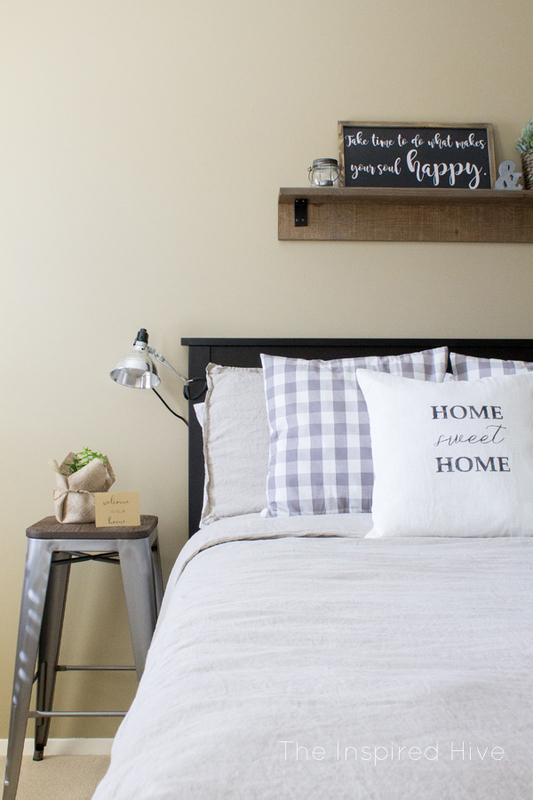 When we moved into our home, we decided to set up one of the extra bedrooms as a guest room. At the time, we were young and focused on wanting the room to be "cool" for our friends and my younger siblings so they would want to come back. Now, I look back and laugh at the decor I chose for the room. It's totally not my style, even back then. Don't get me wrong, it was cute, bright, colorful, and fun, but it was sooooo not me!!! 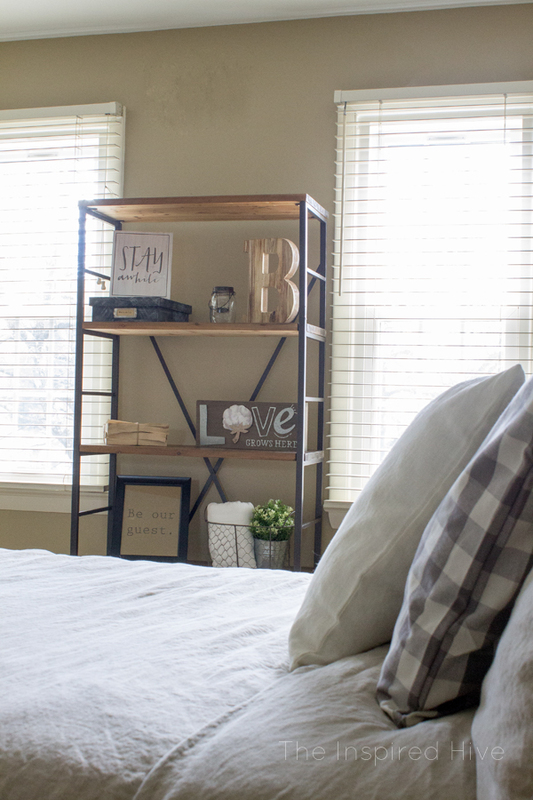 I've wanted to redo our guest bedroom for a long time but felt like I needed to tackle the rest of the house before moving on to a space that was technically already done. Now, I finally have the opportunity to turn this room into a cozy and welcoming space that fits my decorating tastes! 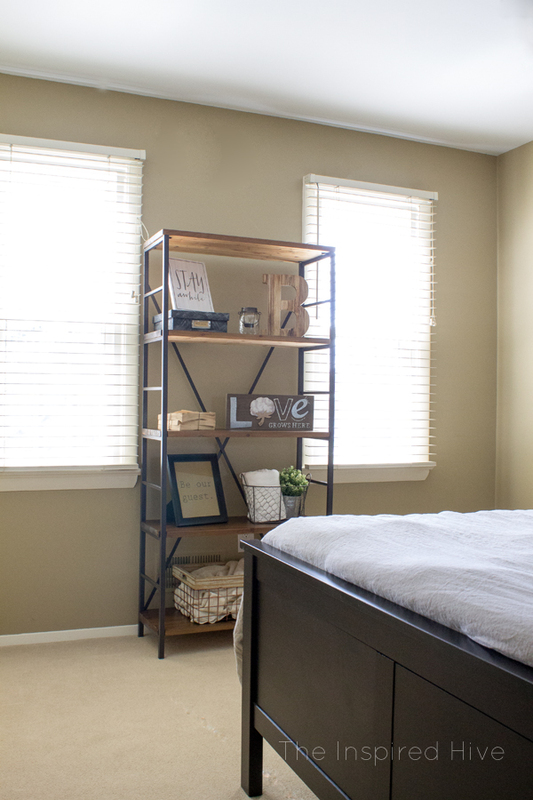 As you can see, the guest room was very different from the rest of our home and was in serious need of a little bit of love! 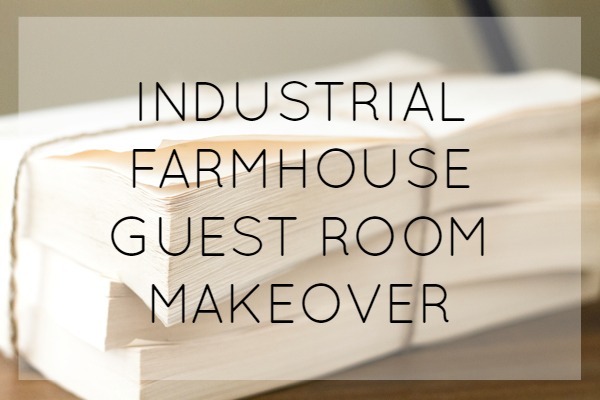 When I decided that I was ready to give it a little makeover, I knew I wanted to go with an industrial farmhouse theme so it would flow seemlessly with our other home decor. I was also hoping to not have to worry about changing the wall color since it was already pretty neutral. 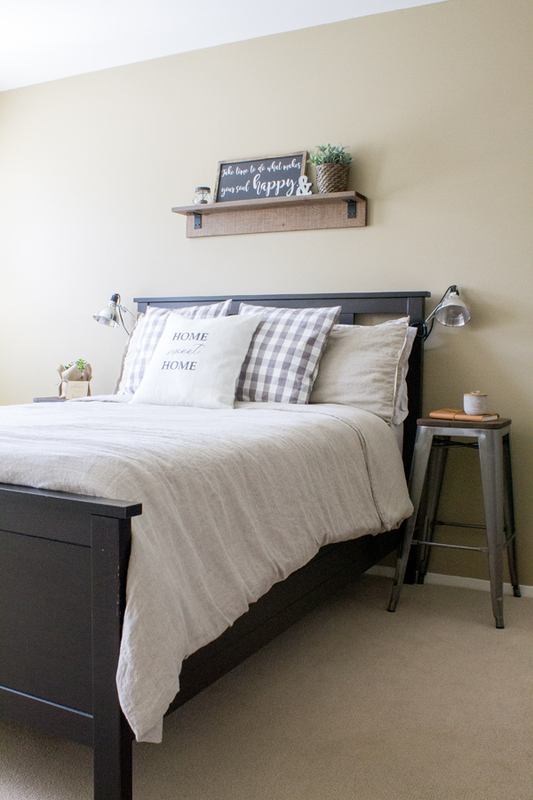 We gave the Ikea Malm bed in the room to my younger brother, but I was hoping to use the extra Ikea Hemnes bed and Ikea Malm dresser we already had on hand to save us some large furniture purchases. A little rearranging, some furniture face lifts, and some new industrial accessories from hayneedle.com were all this room needed to give it a whole new look! Ready to see the new space? Ahhhh! I just love it so much!!! 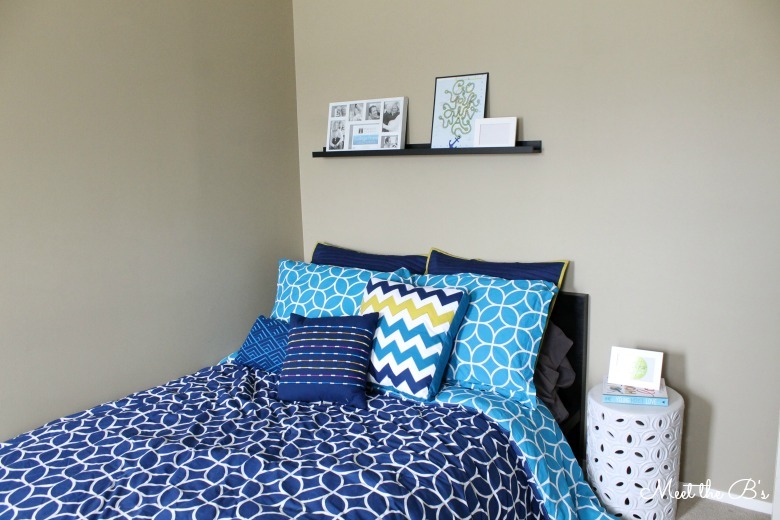 We spruced up that old Ikea bed with a gorgeous linen duvet cover and some new throw pillows. 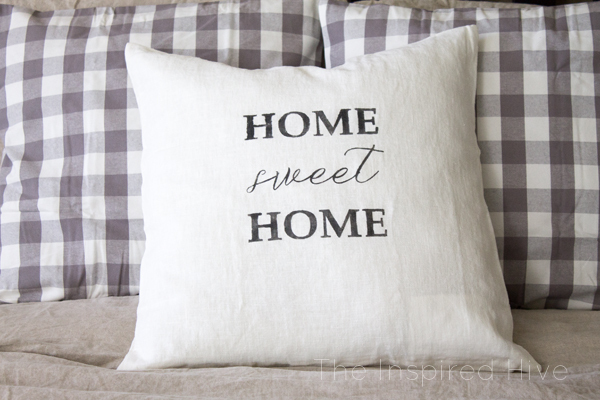 Get my DIY tutorial for the "home sweet home" throw pillow here. 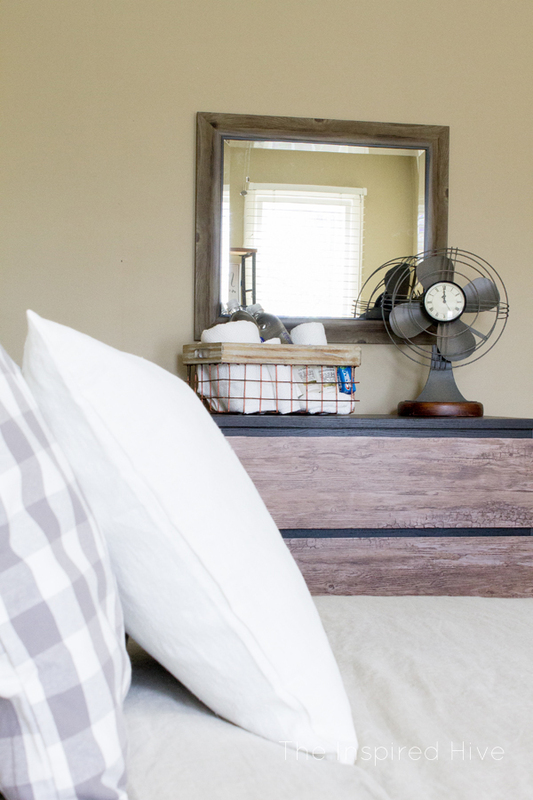 The texture of the linen duvet and throw pillows is perfect for any farmhouse space. 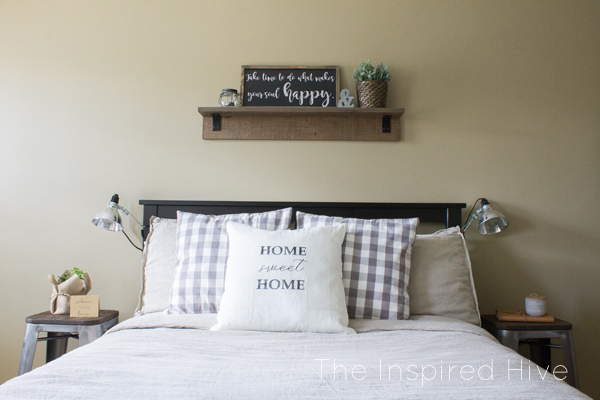 I'm absolutely in love with that wooden floating shelf above the bed. The wood tones and the metal brackets really add to the industrial vibe and help pull the space together. They actually come in a few different sizes and styles. I love the idea of using industrial bar stools (here's some similar ones at hayneedle.com) as nightstands. So much less bulky than a full blown side table. Perfect for a small room like this! We added some clamp lamps from our local home improvement store to add another industrial touch and a little reading light. I love that the clamp lamps keep them from taking up valuable nightstand space! Plus you really can't beat the price of using work lights as lamps!!! 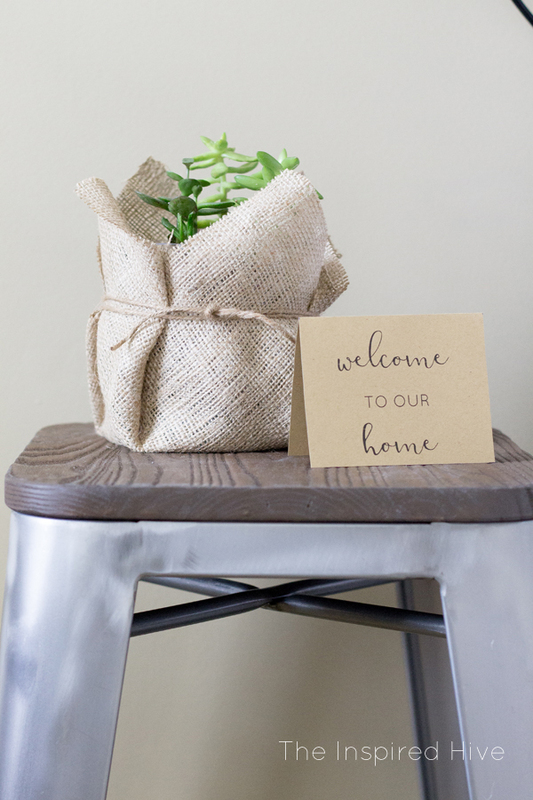 For some simple nightstand decor, I wrapped a succulent planter in burlap fabric and tied it with twine. I love keeping some natural burlap fabric in my craft stash. 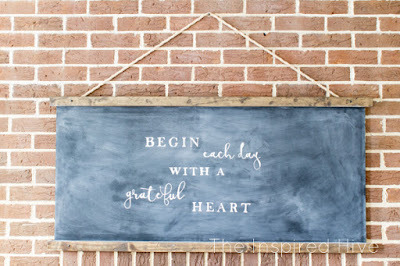 I can't tell you how many times it has been the perfect addition to styling a vignette! 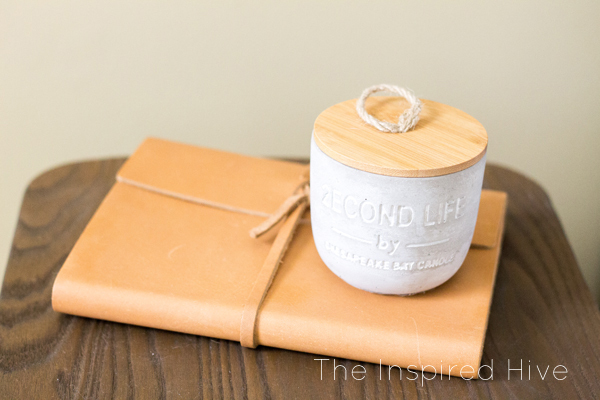 The other nightstand holds this pretty leather journal and this cool cement candle I found. The huge bulky Ikea Kallax shelf had to go. It took up so much space! In came this industrial bookcase. I love the mix of metal and wood. 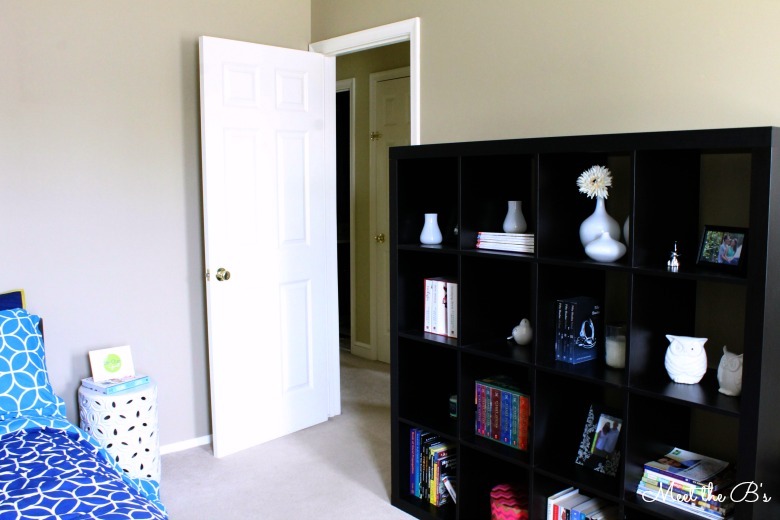 And the size is perfect for this room, but it does come in a shorter cube style as well. I filled it with some industrial farmhouse style art and accessories, plus some throw blankets and towels for guests. 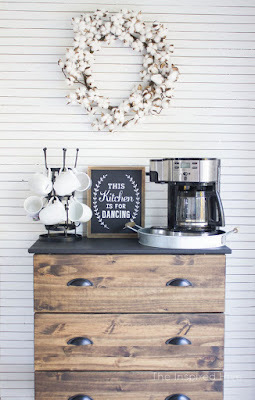 Remember the faux aged metal box I made for one of the Monthly DIY Challenges last year? I finally found the perfect home for it! I decided to go without curtains in this room. Usually, I love the texture and color that curtains add to a space, but in this room I felt they would make it feel smaller and would block some of the much needed light that shines through in the middle of the day. Across the room is that old Ikea dresser we had hanging around. It was a little too modern for our taste but it seemed silly to get rid of a perfectly good dresser. 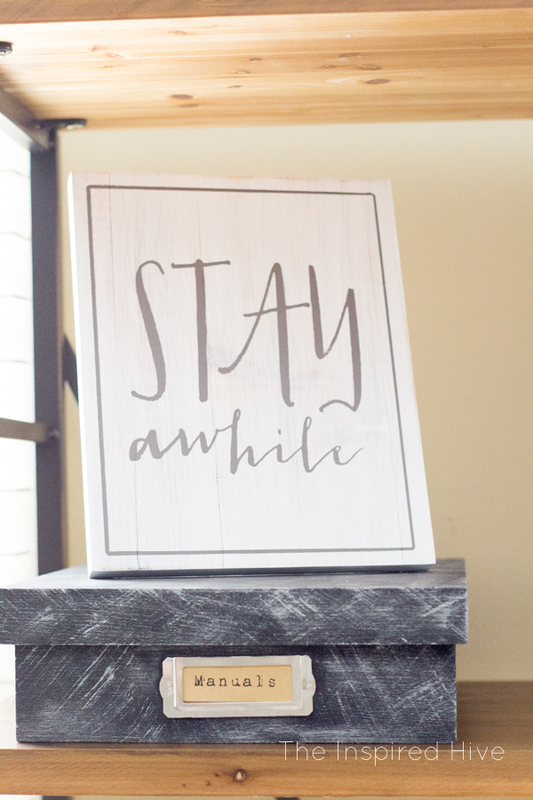 I gave it a whole new look with a little wood grain makeover (tutorial coming soon!). Have you ever stayed at someone's house, rolled out of bed, and tip toed down the hallway hoping that no one would catch you in your pajamas with classic bed head? Every guest bedroom needs a mirror so that guests can get themselves ready for the day comfortably without leaving the room. 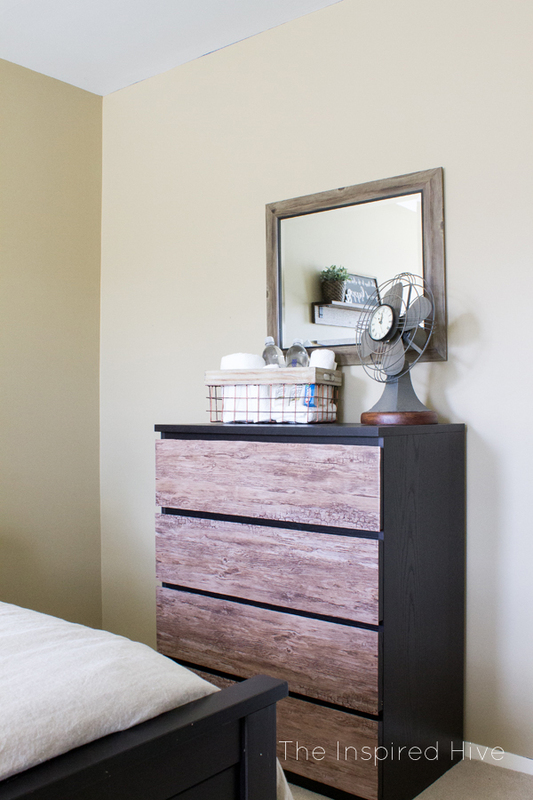 I love the wood and black trim detail on this beautiful mirror I found for above the dresser! 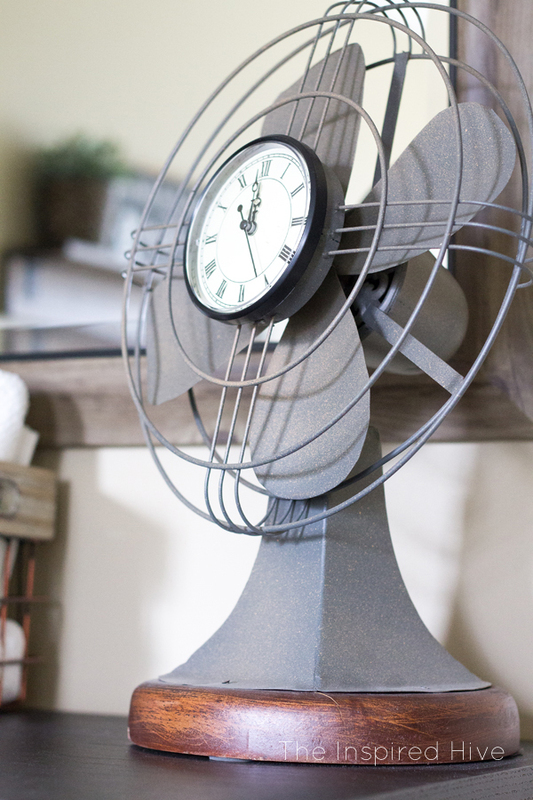 And can we just talk about that cool vintage fan for a minute? It's a clock! A clock is another guest bedroom essential item, and when I saw this one, I just had to have it! It adds the perfect touch of vintage style! 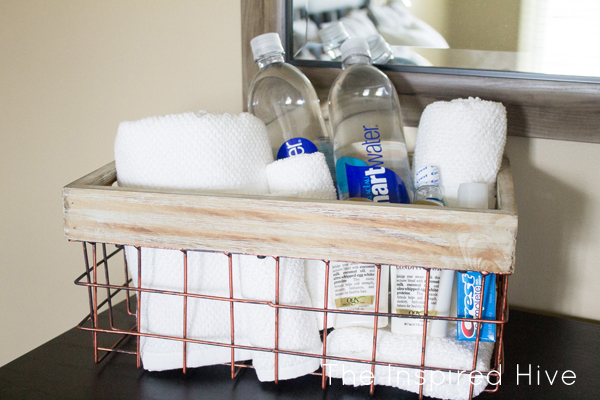 One thing you can do to make a guest bedroom feel more welcoming is put together a basket just for your guests. 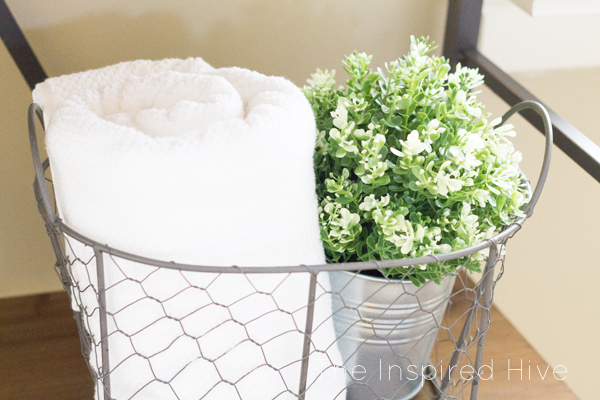 This metal and wood basket was perfect for this! I added some towels, water bottles, and toiletries for guests. You could also add some snacks, magazines, or even some pamphlets on area attractions. Wall color- Behr "Harvest Brown"
It's SO pretty Nicole!! And I can totally vouch for how comfy that bed is too! ;) It's definitely come a long way and it totally fits your style now! Love the new space, Nicole! We're getting ready to create a guest room for my in laws. I didn't even think about a mirror but you're absolutely right, that's something I would appreciate and I'll definitely add one now. Also love your toiletry basket. Such a cute idea!